When I say I have been planning what I am packing for Europe for ages I'm not joking. Oh, and when I say planning, I really mean stressing the buggery out. I seriously lay awake at night wondering if I will look like an idiot in shorts or sneakers. Should I bring 2 pairs of jeans? Is 4 striped tops too many? Should I go completely minimalist, so I have more room to bring home souvenirs? Or should I bring enough so that I don't have to repeat a single outfit? I've annoyed my IRL & online friends with a thousand questions begging their opinions. Apologies friends. It's no big deal, right? I packed everything in a carry on for Australia, and for a few days in NYC and that was real winter. So summer in Europe should be easy right? I swear, winter is easier. Layers. One type of weather: cold. Done. It's supposed to be warm in Paris, hot in Rome and cold in Dublin. So I need to pack all the things. Seriously, I'm stressing out just writing this. I finally sat down and settled on 25 items and made 50 outfits. Woah, right? I didn't need 50 outfits. I don't even need 25 outfits. But it can be done, apparently! I put everything in the carry on and it fit just dandy (with Millie too) but it was too full for my liking. Plus, I don't need 50 outfits, remember? I had to get rid of some stuff. But I figured I might as well show what I came up with, right? As Thomas Edison said, 'I haven't failed. I've just found 10,000 ways that don't work.' 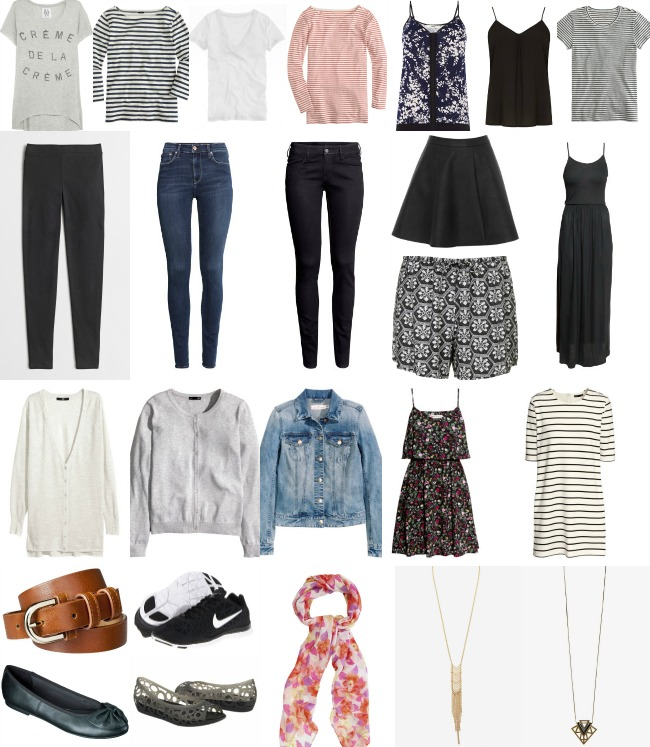 That is not relevant at all, so here is a packing list of 25 items that make 50 outfits! Here is everything in the bag: Except for underwear etc. Everything fit easy peasy, no rolling or packing cubes or anything fancy, I didn't even extend the bag. Just plopped everything in there. So I could pack it better, just wanted to show that it could fit. With a cat. (Ok, I lied there are 3 things missing in the below photo - the belt and the 2 necklaces, please forgive me). However, as you can see it's a lot and once I put all my makeup, hair stuff, underwear, misc crap in there, it will be chock full and there will be no room for shopping, which is obviously not okay. 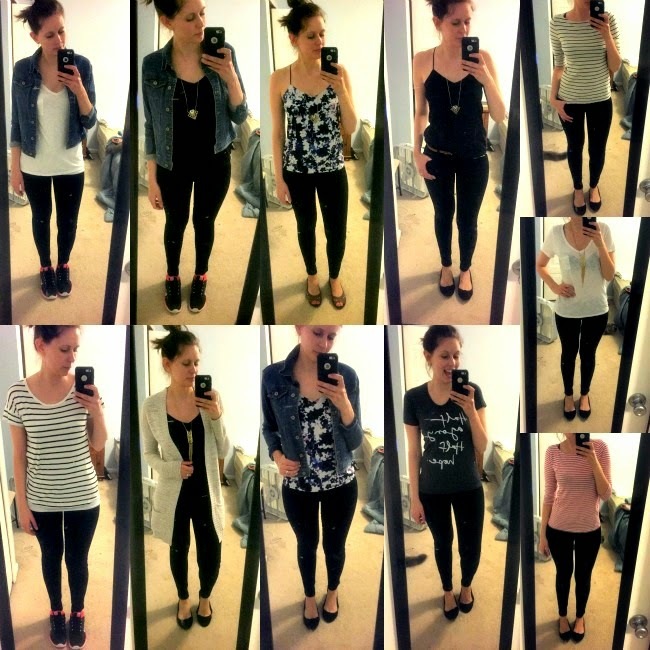 And here are approximately 50-ish outfits: I tried not to get too 'add a necklace, voila it's a new outfit!' so if there are duplicates or outfits too similar, it's not intentional. Also, I'm no fashion blogger. You've been warned. - Technically, there is only 24 items because the black / floral cami is one cami, but for adaptability sake let's call it 25. - The black flats in the pictures are different than the ones I want to bring, not that you can even see them. I ordered these ones, I own them in natural and wore them all over Australia and I wear them to work all the time and they are super comfy so I think I'll be fine. 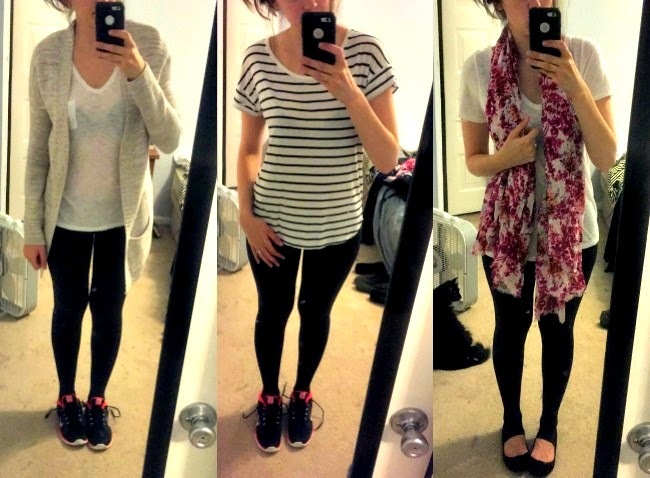 - The long sleeve striped top is not the one I'm considering taking, the one I want to take is from Target and I just hadn't received it when I took these photos. - The lighting in our bedroom at 10pm at night is so top notch, and my iPhone really captured all the details but just in case you're curious, there are blue jeans, black jeans and black leggings (separated in the pictures).They do all look the same but they will look different in real life in Europe. Right? - I will wear a cami under the white tee in public. Apparently this blog doesn't count as public, sorry about that. - Leggings are for travelling only. - Sorry about the dirty mirror. - I have already decided I'm leaving the Nikes. They are not cute and honestly no more comfortable than my flats. If my feet cry and need sneakers, I'll buy some. But I think I'll be fine. If I had some New Balance sneakers, I'd take them because they are cuter than my Nikes. I'm making the right decision, right? - I'm considering swapping the denim jacket for the below grey jacket - but then I'll have a grey jacket and a grey cardigan and is that too much grey? In case you ever wondered what goes on inside the head of a crazy over planner who is also indecisive.. here you go. So if you are going somewhere and need 50 outfits, I hope this helps you. But like I said, I don't need 50 outfits so I need your help - I think I know what I'm going to cut out thanks to bugging my friends on the weekend, but I would appreciate your opinion. What do I cut out? What don't I need? What is uglier than it's friends? This is absolutely amazing. I'm not traveling anywhere, but I like the idea of shopping my closet and trying to create different outfits. I have VERY few pieces of clothing (I am just not a clothes shopper) but a lot of my stuff doesn't even get worn because I'm not one to figure out outfits! Love this! I love how on top of this you are! I'm that person that would pack the day before and then panic over everything!! I used to be all about bringing a new outfit to wear for everyday (and then another one for dinner of course haha) but lately I've gotten more into bringing classic/versatile pieces that I can mix and match. Anyway, I've never been to Europe so I feel like I'm no help in telling you which outfits you definitely should bring! Whoa!? You go girl. That's freaking amazing! You are so amazingly thorough!! And I am SO EXCITED I finally get to see you in a Barcelona Cami!! It looks great on you! I agree with Biana - keep the denim jacket. I do think grey jacket + grey cardigan are too similar for this trip. You will feel like you have more variety and more options if you have the denim & the cardigan! 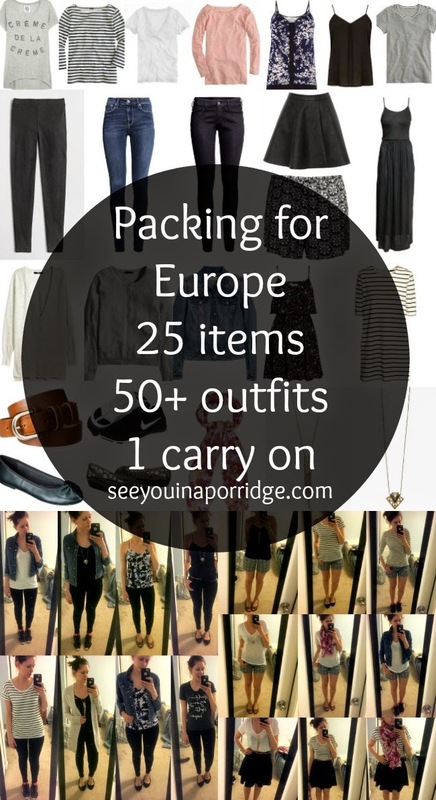 We ran into similar issues when deciding what to pack for our Europe trip! Because London was chilly and rainy, and Italy was sweltering. I think I only had maybe 10 outfits for 3 weeks, so we ended up hitting up a laundromat in Venice, because we were so desperate for non-sweaty clothes. We also had to get strategic about what to do with wet towels and swimsuits, since we didn't want to get the inside of the backpack any mustier than it was already. All in all, our trip was a lot less cute than yours is going to be. Athletic shoes and t-shirts. Great job mixing and matching with your stuff! I'm not sure if you'll be traveling around Europe but one thing to note...carryon sizes are different for airlines within Europe. I've gotten hit by that before...they're way smaller and will charge a FORTUNE if you go over! I'll need this when I go to Europe next year. LOLOL @ apparently this blog does not count as public. UMMMM...so you're coming to pack all my bags from here to eternity, right? Cool, Thanks. You are so good. I am a purse girl so I would have to include handbags for these outfits (which take up so much room). Fun fact - my husband is a shoe guy so he wants to pack 3126385764354357 pairs of shoes for any vacation so we can NEVER be carry on people. Our accessories eff us up every time. Nicely done! LOLing at your notes and thoughts. Definitely a lot of good options. Personally, I'd leave the shorts but hey, that's why I don't own any! I hate shorts, I don't think they look flattering on anyone. Same with maxi dresses. I'm clearly in the minority though so don't pick based on me. Girl this is absolutely amazing!!! I love all the outfits that you have created out of those pieces and that you can mix and match things on the go. I would say yes, leave the nikes behind if your flats are comfy and the fact that you can always buy a new pair of shoes abroad. I like the jean jacket, but you know my feelings run deep for the jean jacket so I might be biased. This is awesome! Great outfits for sure! 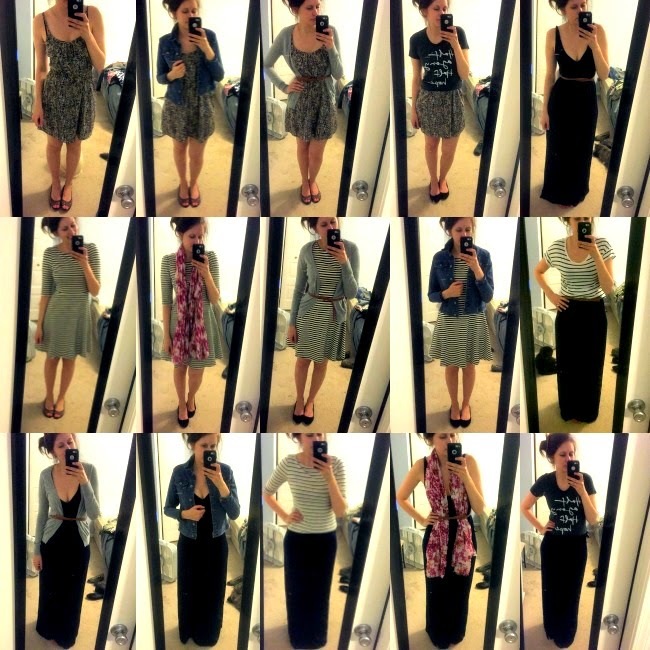 Maxi dresses are always a must and pack really easily. The sad part about this is not only do I go through this same ordeal every time I pack for a 2 day trip, but I take way more things for that type of trip than you're taking to Europe! I'm impressed with your packing skills! Girl I have been struggling with this exact problem for months. I *think* I've got it narrowed down? Who knows. Maybe I'll end up traipsing through the UK completely naked save for my sunglasses. That's cool though, right? Some great staples in here! Nice work packing and I love that grey jacket. So versatile. All of your outfits look great! Yeah, Dublin will be cold, but as long as you have layers, you're good! 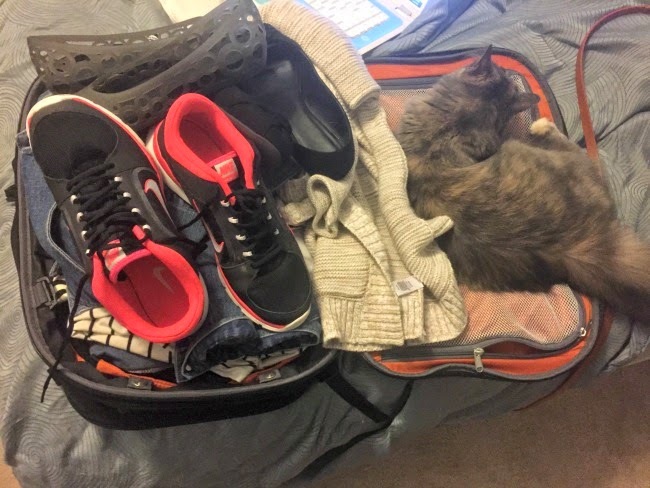 I saw that you packed comfortable shoes...MOST IMPORTANT! Oh, one tip I forgot to mention earlier: The Rome metro is pretty easy to navigate, but be careful on the buses. The buses don't announce the next stop on intercoms, or anywhere, so it's easy to get lost! haha. Good thing is that Rome is pretty small so just the metro (or the trams) will do! I love your outfits! They are all perfect! Love mix and matching. My only suggestion would be to bring a sneakers but you can always buy them when you get there. They have great sneakers in Europe. You are so good at packing. I would keep the jean jacket sine you already have the long and short grey cardigans. So many outfits, awesome job! Umm hello can you please come and pack my suitcase for my upcoming THREE DAY TRIP TO KANSAS that I can't fit into a suitcase?! we usually go places where a washer/dryer is available so i bring the bare minimum. i packed for a 10day trip in just a carry on and did 3 loads. Oh this is great! Thank you for the tips! Wow! That's awesome! Good job. I'm terrible at mixing and matching. Can I have your wardrobe? Thanks. Also, I wouldn't go without my Nikes, but that's just me because I have pain issues stemming from my feet/arches but yeah I think they're cute and would bring them. Also, denim. Also, I really love everything but if I had to give something the axe it would be either the striped tee or the white see-through tee, or the striped dress if you kept the striped top. I also wouldn't bring three pairs of jeans, but I hate wearing jeans so my advice is not helpful to you. You are too good!! I'm the worst over packer! We went to my in laws for the three day weekend and you should have seen how much crap I brought haha! I need a separate bag for just my shoes gahaha! I need to try your method badly! Ugh Im the queen of overpacking so you wouldn't want to take my advice plus I wouldn't know what advice to give....seems like you have some cute mix and match outfits lined up. That is some next level packing! I say, bring the things that make you happy when you wear them. Also, if you're staying somewhere even remotely warm, you can just wash your stuff in the bathroom and hang it up to dry overnight. Sounds a bit chavvy but that way you can wear the same well loved clothes over and over again! Who's going to care?! This post = awesome! I love when people put together capsule wardrobes like this - and your outfits are too cute! I'd just like to make this my closet, if that's okay ;) Also, so jealous you're going to Europe! And how on earth did you get that all into that tiny bag?? This is amazing!! I love how you created so many different looks! I need to do this just in general with my clothes instead of just buying more pieces that I don't need! love what you chose! seriously!! and i love how there's a cat next to the clothes and suitcase because my dog does the same thing! 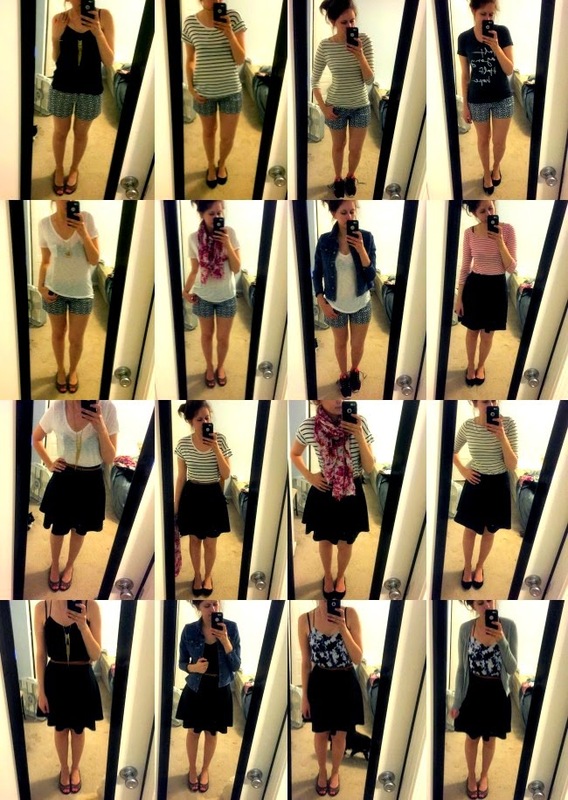 I love this idea, I love your outfits, and I'm seriously considering doing this for my regular, standard wardrobe. "If you're going somewhere and need 50 outfits, I hope this helps you!" HAHAHAHAHA! But seriously, this is a great way to pack. And you're totally right - it will be hot as balls in Rome and absolutely a damp cold chill in Dublin. I'd pack another jacket, but I get cold real easy. Ahhhhh, you're going to have so much fun!! Well the jean jacket is definitely a must! it looks so good with so many of your outfit choices! Love! And I feel like a striped top is necessary for a Europe trip. As well as a good scarf :) Ahh I'm so bad at this! Haha! I love all of your outfits! I don't even know what that graphic tee says but I want it LOL! Ooh, you look fab in all these outfits. I would stick with the denim jacket. You are a freaking packing machine!!!!!!! I love that you took pics of your outfits. If I did that then I'd have zero issues. I don't though so Im prone to the overpacking, having carry-ons madness. I can't wait for you to take the trip and to read all about it!! I can't believe how organized you are! I'm just anxious to see what all you go with! There wasn't much re-wear in Rwanda, other than jeans, because everything smelt like goats and we didn't have a guaranteed place to wash our clothes so I'm really curious to see all the different outfits you can come up with! I like the gray and denim jacket. I'm sure I'm not helping but they both look great! You are a packing WIZARD!!!!!!!!!!! So well thought out and organized! Is that an ebags Mother lode bag? I have one and LOVE it. I even got my boyfriend and parents to all by them. I only travel with carry-on bags now. I'm terrified of losing my luggage. Just so you know, you just totally saved me! I am going to Italy for 3 months as a study abroad student, and have been trying to find a post like this where I can pack light and still get tons of different outfits out of it. Thank you so much! i am so glad! enjoy Italy!